So by now you’re probably thinking this is going to be a food blog and considering the number of recipes I’ve collected over the years it easily could be. But I have way too many interests to limit myself to one, and besides, with all that cooking you’re gonna have to clean up eventually, right? So today we’re gonna make my favorite all purpose cleaner. Since I noticed yesterday that my bottle was almost empty this is very convenient timing, I must say. The last few years I have been trying to get rid of the potentially harmful chemicals in my house. The ones disguised as household cleaners are some of the worst. I guess that since we aren’t actually ingesting these products, the government has decided it’s fine for companies to sell them to us for a lot of money. Of course if you’ve ever sprayed one of these products on your counter you’ve noticed how much of it vaporizes into the air which you then inadvertently breathe in. And heaven forbid one of your kids accidentally does ingest some of it! Now you get to frantically call Poison Control and possibly make a run to the Emergency Room. No thanks! 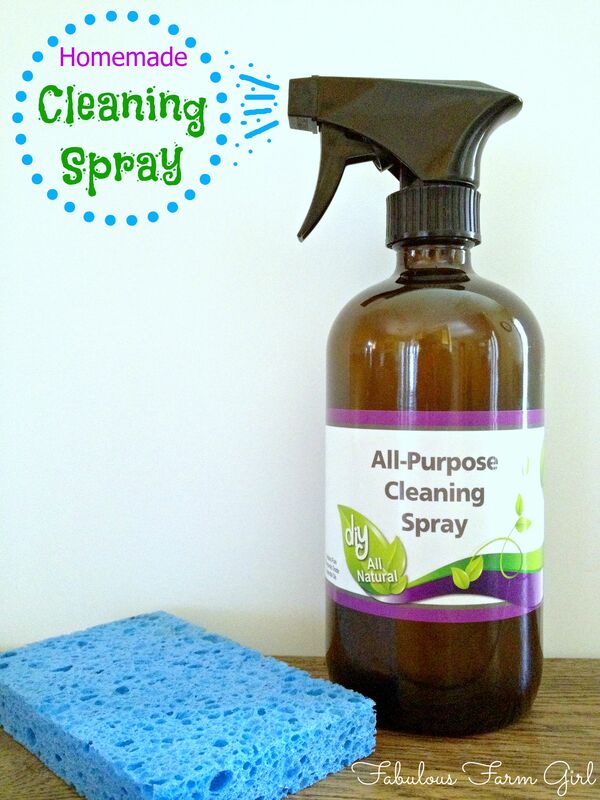 This wonderful smelling cleaner has only 5 ingredients (well, if you count the essential oils as one ingredient) and it is safe for most surfaces. I have used it on tile, glass, marble, granite, wood, stainless steel, porcelain and acrylic. Water—this stuff makes up 60% of the human body and it is recommended that we drink eight glasses of it a day. Oh wait, wrong post. Sorry about that. For this recipe the water is just there to dilute the rubbing alcohol and the vinegar. White Vinegar—effective at killing most bacteria, germs and mold due to it’s acidity level. 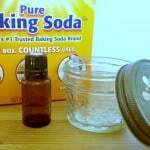 On the internet you can find hundreds of household uses for white vinegar. Castille Soap–a true soap made with 100% plant oils (no animal oils like tallow) and no chemical detergents so it is biodegradable. I use Dr. Bronner’s brand. White Fir—not only does white fir smell wonderful but it also supports clear breathing and respiratory function. 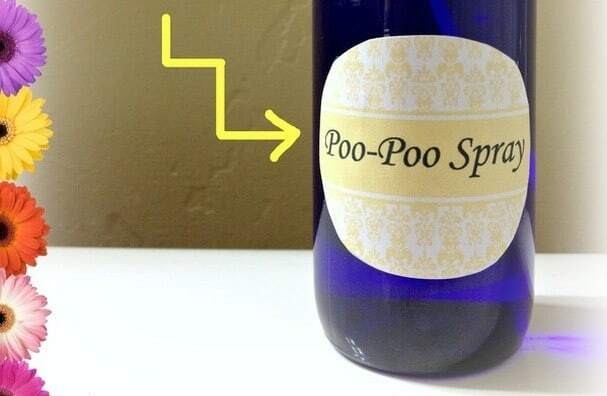 Its aroma energizes the body and mind and who doesn’t need that when they’re stuck cleaning. If you don’t like the smell of melaleuca or can’t use one of these essential oils for some reason feel free to swap for a different one. 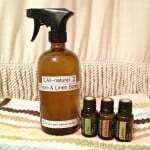 Most essential oils have fantastic cleaning properties and will do a great job in this cleaner. Just make sure you use the highest quality essential oils you can find. I only use therapeutic grade oils for their purity and potency. Mix all ingredients in a 16 oz. glass spray bottle and label bottle. Shake well before and during use. Note: I recommend using glass spray bottles when making recipes contain essential oils. That is because essential oils, especially the citrus oils, are not very friendly to plastic. Glass spray bottles will last forever and are a great investment. We are also working hard to cut chemical cleaners from our home. I love how essential oils have helped us. Thanks so much for linking up at Oil me up Wednesdays. I hope you will share again this week! Hi Janine–it really does feel good to walk past the cleaning aisle at the grocery store knowing I’ve got better stuff at home. I’ll see Wednesday and come back soon! Great post. This week over on Wildcrafting Wednesdays we’re hosting a special Hygiene Edition and this post would be perfect in the carnival. I’d love it if you would pop over and share this post with our readers. 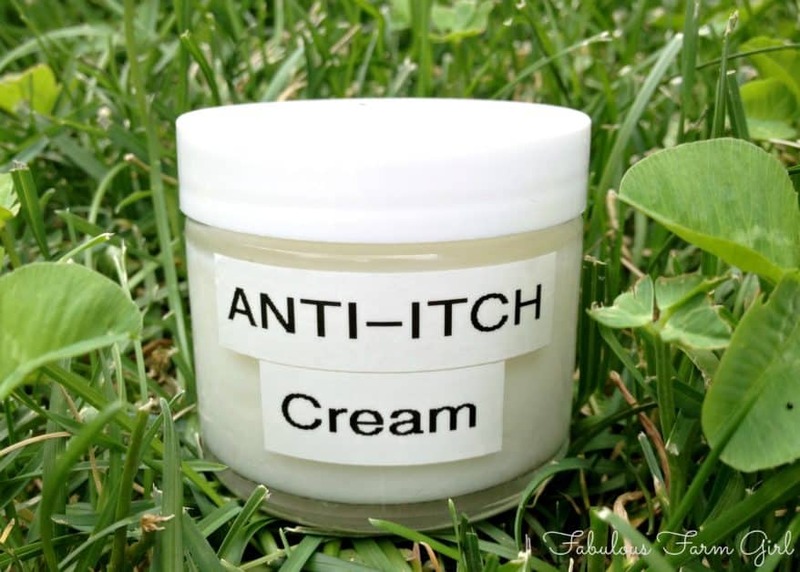 Hi Kristin–I’m always happy to share with people ways they can rid their homes of toxic chemicals. It’s great that your website has the same goal and I’m happy to stop by. Have a great say! 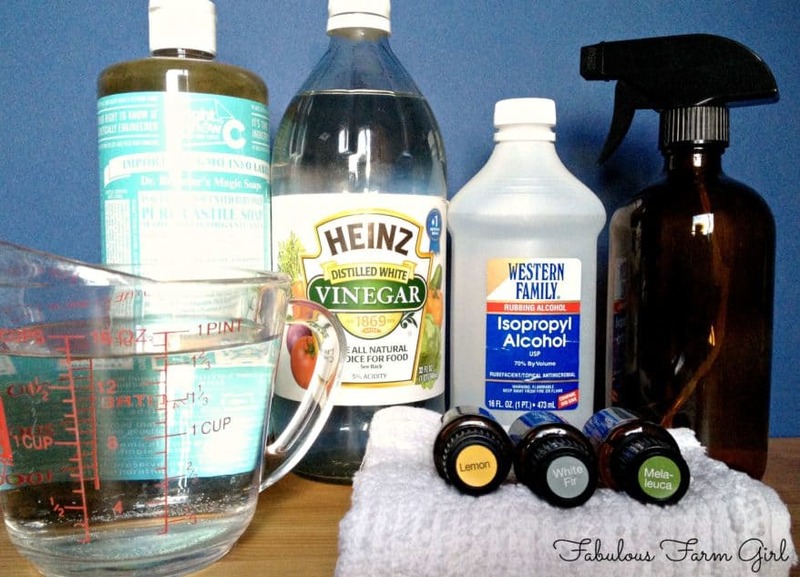 This is great, I am always looking for natural cleaning methods. Last week I made my own glass cleaner with vodka (because I had it already to make natural bug repellent) and essential oils. Works great. Hi Sarah–thanks for stopping by. I don’t use vodka because it costs a lot more. But if you already have it on hand you can use in in this recipe instead of the rubbing alcohol and it will works great. Have a fabulous week! Does it have to be in a dark glass bottle? Or can I just buy a plastic one from anywhere? Hi JoDale–thanks for your question. The spray bottle does not have to be dark but I do recommend that it be glass. Lemon (and all citrus oils) will eat plastic. That said, the lemon essential oil is very diluted so it will take quite a long time. You could use plastic if you want but be aware that the bottle won’t last forever and will need to be replaced eventually. That’s awesome Lauren! I can’t encourage you enough to make your own cleaners. It’s one of the best ways to decrease your family’s toxic load. They are fast, inexpensive and so effective. 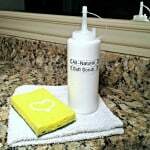 Be aware that a lot of the “all-natural” cleaners on the market are not all-natural at all. It’s just marketing. Once you make your own you’ll never go back. Go for it! This is great. I just started making my own cleaners, largely white distilled vinegar/water concessions. But the essential oils will obviously make this smell better. Hello Caryn–thanks for stopping by! So impressed that you’re already making your own cleaners. It’s such an important way to lower your family’s toxic load. 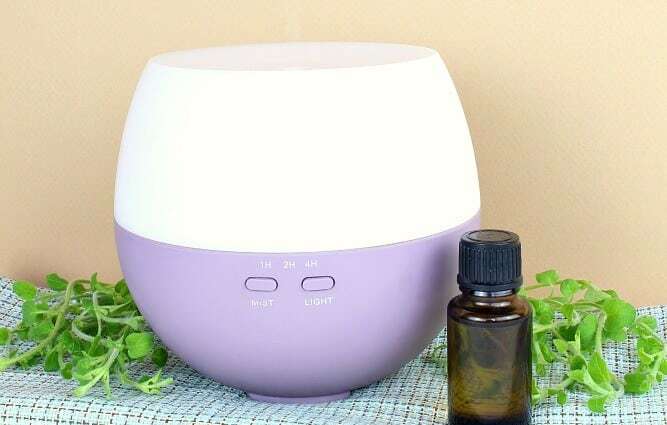 Essential oils will not only make your cleaners and your house smell fantastic, they also bring powerful anti-bacterial, antiviral and antiseptic properties. They will really take your cleaners to the next level. Have a great week! Can you substitute the alcohol for anything else? I dont like to use that in my home, my daughter has had some weird reactions. Can you use the 91% running alcohol Or Is that real no No? Very awesome! I was just thinking last night of how i could make air fresheners! Do you have any suggestions or recipes for this? something that lasts when sprayed??? Thanks for the awesome articles! I’ve read somewhere you should not mix Castile soap and vinegar because it creates “gunk” any truth to this statement??? All purpose cleaner. Can u use it to mop floors?